Discussion in 'B4R Tutorials' started by Erel, Apr 19, 2016. While the above design is simple and works properly for very small examples, it doesn't work with larger programs as the single thread cannot do anything else while it sleeps. The B4R solution is to use a Timer instead. There could be many timers running and they will all work without interfering each other. CallSubPlus is similar to a timer that fires once. CallSubPlus allows you to run a sub after a specified duration. Like a timer it doesn't block the thread. The sub signature must be the same as the subs above. Internally the single thread runs in a loop and manages a messages queue. You can use AddLooper keyword to set a sub that will be called on each internal loop. This is similar to a timer that runs as fast as possible. Note that you can call this method multiple times to add multiple subs that will run each loop. If you find yourself calling AddLooper and then calling Delay in the "looper" sub then you should replace it with a timer. Arduino Due: 415 loops per millisecond. ESP8266: 500 loops per milliseconds. jinyistudio, janderkan, Procesor and 11 others like this. B4R rocks. Well done Erel! Hi Erel, I've tried your example to test addLooper keyword on my ESP8266 (NodeMCU 1.0 board). If I use this setting as Board Type (NodeMCU 1.0 (ESP-12E Module) (UploadSpeed = 921600)) I get about 300 cycles loops every millisecond, I think that by default the CPU is at 80MHz, but if I put this setting ((1.0 NodeMCU (ESP-12E Module) (CPUfrequency = 160)), the serial write speed remains at 921600 but the CPU runs at 160MHz and actually get a doubling of speed coming around 550-600 loop cycles per millisecond. All this I had already tried long time ago with Arduino IDE and doing various tests I saw that the doubling of frequency is effective and you will get twice the performance, this seems to be the same for all ESP8266 boards, I have an ESP-01 and works even with that. jinyistudio, Johan Hormaza and Erel like this. ESP32 added to the list. Will it be supported by B4R in the "near" future? Apparently, the ESP32 Arduino core is now supporting a Webserver but there is no example yet included. The performance list in the first post. 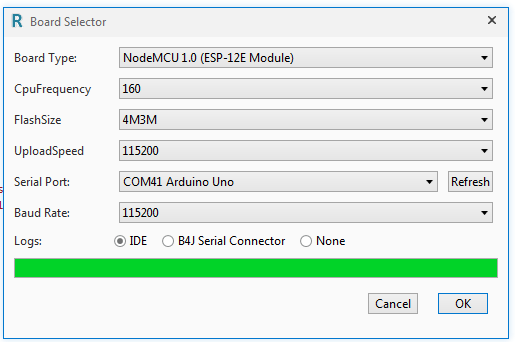 B4R v1.80 beta #2 will add (initial) support for ESP32.